Find hostels and budget hotels in New York starting at just €12 at Hostelbookers.com. Check Hostelbookers.com and find London hostels starting at just €14. Find hostels and budget hotels in Paris starting at just €23 from Hostelbookers.com. 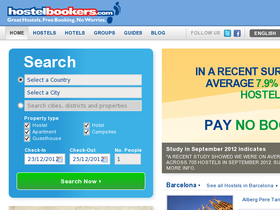 Find quality budget accommodations in over 2,900 locations worldwide at Hostelbookers.com.